Why is some marketing bad? Being in the ad business I can’t help but watch TV ads with a critical eye. Who is the target? What is the brand? Does it have the emotional tug to convert a sale? In short, is it effective? I try to figure out the brand or company the ad is for before they reveal it. Some companies do a great job branding their ads and others leave you wondering – do they really know their audience, what company/brand was that for? I have found myself wondering when the product advertised is for women if the ad was created by a man, because they totally missed the USP and audience pain motivator. A great example of branding is Target’s original TV ad campaign and it’s evolution over 2 years. They began showing the target symbol with their name. The ads had a consistent style of photography and rhythm. Over a year’s time they evolved and dropped the word “Target”. This was possible because of the consistent style of video but also length of time they ran the ads had impressed their brand image on all consumers so they intuitively knew the brand before the target symbol was shown at the very end. Eventually, the target symbol was all that was needed. Their marketing success was evident when competitors started mimicking their style of TV ads. Old school ad men would be horrified that the brand was only shown at the end like an exclamation point. Rules of marketing would have you show the logo frequently in one spot. But rules are fluid and when an ad is done well it is memorable and has a branded style. Bad ads are memorable for a different reason. Or they don’t make an impression at all. Either way, a bad ad is an expensive mistake. What do you think when you notice a bad ad, print or TV? I have been known to say "Why does that ad sound like a guy created it?" Eye-tracking studies show 18-34 year olds ignore banner advertising on web pages they visit. These stats should make every marketer re-evaluate their marketing and answer the big question… why? David Ogilvy advised marketers, years ago, to focus on “content of your advertising, not its form.” Content today is touted as the best way to increase SEO rankings and gain authority in social marketing. It appears content has always been the primary influencer in advertising? A consumer survey indicated that 73% of consumers would not be affected if brands they use disappear. This fact has broader impact on our economy. 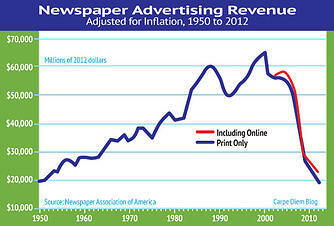 Just consider this chart of newspaper ad revenue. 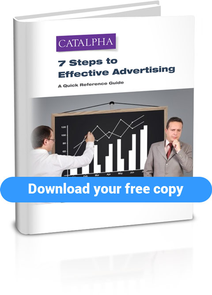 Ineffective marketing impacts more than the company who paid for the marketing. This chart shows the decline in revenue in the publishing industry. Businesses that are embracing content are seeing a great impact on their internet ranking as well as web traffic. They understand that going beyond product messages that are mostly ignored by the consumer and consistently delivering value to their target audience positively impacts their brand reputation. If you understand networking you know it is about creating relationships, putting the interests of the person you are talking to in front of your need to talk about yourself/your business. Relationship marketing is about creating an emotional connection with the customer. Promotional style of advertising is only pushing your agenda. Promotional marketing has a purpose and a place. Some people want to ban it completely because of the stats I published above. But come on… if you need a mattress you are going to look for the best promotion. We may be tuning out advertising but we do it selectively. These times have provided so many more ways for marketers to connect with consumers. How do we create marketing that isn’t “bad”? The diversity of platforms that are available to reach our audience means we have to be more diverse in how we deliver the message. Just as we use to call one ad format an image ad compared to a retail ad, we must use a targeted approach based on the way the consumer wants to be engaged on the different platforms. Always know what is the emotional trigger for your audience and focus your content appropriately. The best marketers make sure they understand their target’s motivators so they can create the content that connects with their audience. You won’t wonder whether a man wrote the ad targeted to women. Customers will continue to selectively tune out ads. Many marketers have preferred to continue marketing as they “always have”, thereby missing opportunity to improve customer relationships and capture new audiences through new marketing tools. It’s time to accept the fact that what worked before is not going to deliver the results you need. The best way to improve your advertising results is to define content marketing and social media strategies that meet customer needs. Evaluate the gap between customer behaviors to your marketing mix and change your efforts to be customer centric. And publish content to inform and entertain. Keep your eyes open for opportunities to help your customer and create a dialog thanks to the new marketing tools… social media. And finally, be honest in evaluating who your marketing is created for. A bad ad is more expensive than the cost to create and place.